I am encircled about eternally in the arms of his love. Throughout my life I have found great peace through prayer. He has answered my prayers of thanks and expressions of joy, and has also comforted me in difficult times when my needs were more insistent and my urgency greater. As I approached the Lord during one of the latter times, when a beloved brother fought for his life in an ICU, I felt (not for the first time) as though the Lord simply put His arms around me–not physically, but spiritually–and though I didn’t know what the outcome would be, I knew that He was aware of our needs and would do what was right for His children. 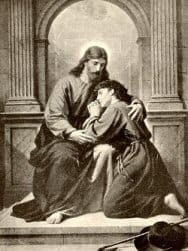 It occurred to me then that when we approach our Heavenly Father like the children we are, He does what every loving parent does: He puts His arms around us, and prayer becomes like the embrace of heaven. Psalm 57 begins this way: “…in the shadow of thy wings will I make my refuge…” What a comfort to know that the Lord is willing and waiting to give each of us shelter in the shadow of his wings, and encircle us in the arms of His great love. This song is needed right now for so very many reasons. Thank you! Praise the Lord for His sweet promises n love.. Thanks sally for the great song. It’s a blessing for us. I like to gather music for my grandsons who sing a lot.